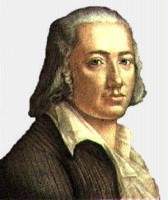 Georg Wilhelm Friedrich Hegel was a German idealist philosopher born on August 27, 1771 in Stuttgart to a family who had for generations been civil servants. Although he was encouraged to become a clergyman, Hegel instead chose to pursue philosophy and an academic career. Hegel began as a great admirer of Immanuel Kant and his "new philosophy" depicted in Critique of Pure Reason. He hailed it as "the greatest event in the entire history of German philosophy." After David Hume's derailing of philosophy in the mid-eighteenth century, Hegel was impressed at how Kant managed to circumvent the problems it presented. Hume had stated that we can really know nothing and that our only source of any kind of knowledge at all is experience. According to Hume, in order to build any philosophical system, one needed such elements as causality (cause and effect) and this, Hume had shown, was mere supposition. No one had ever experienced a cause and its ensuing effect, but merely the succession of one event following another. It appeared that this was the end of philosophy. Kant, however, came to the rescue of philosophy by brilliantly suggesting that causality was merely one of the ways in which we perceive the world - like space, time, color and so on. Indeed, Hume had been correct; causality does not exist, instead it exists within us and in our way of perceiving the world. As much as Hegel enjoyed and was influenced by Kant, he decided that his was not the only possible philosophical system. For Hegel, Mind or Spirit was the ultimate reality. He was a philosophical monist who held that everything is interrelated within one vast, complex system, or whole, which he called the Absolute. As prob ably the last great system builder in philosophy, Hegel in his most famous work The Phenomenology of Spirit, attempted to show how consciousness develops by way of a dialectical (logically argumentative) process until it is identical with the whole of reality, which itself is pure thought or spirit. Hegel's complex, sometimes hard to understand, dialectical method is best put forth with the concepts of thesis, antithesis and synthesis. The idea is that any given phenomenon (thesis) contains within itself contradictory aspects (antithesis), which require a movement towards resolution (synthesis); and that our understanding of reality occurs according to a process that encompasses this dialectical form. This gradual and necessary unfolding of thought is a progression towards absolute truth or an absolute universal mind or spirit. For Hegel, the attainment of this absolute truth is the attainment of completeness or the transcendence of all limitation. "The significance of that 'absolute' commandment, 'know thyself', whether we look at it in itself or under the historical circumstance of its first utterance - is not to promote mere self-knowledge in respect of the particular capacities....of the single self. The knowledge it commands means that of man's genuine reality - of what is essentially and ultimately true and real - of spirit as the true and essential being." Unfortunately, no brief summation of Hegel's philosophy can justly convey the scope, detail and complexity of his ideas. His dialectical method produced one of the most grandiose metaphysical systems ever originating from his ambition to overcome the deficiencies of logic and culminating toward Mind as the ultimate reality. Georg Wilhelm Friedrich Hegel's views have had an enormous impact on social and political thought over the last two hundred years. While Karl Marx utilized Hegel's dialectical method in the development of historical materialism, Jean Paul Sartre developed his existentialism and analysis of being-for-others from insights contained in The Phenomenology of Spirit. Hegel once said of himself that: "only one man understands me, and even he does not."